Kobzar Ostap Veresai and his wife Kulyna. The photograph was taken in 1873 when Veresai performed at the Archeological Congress in Kyiv. 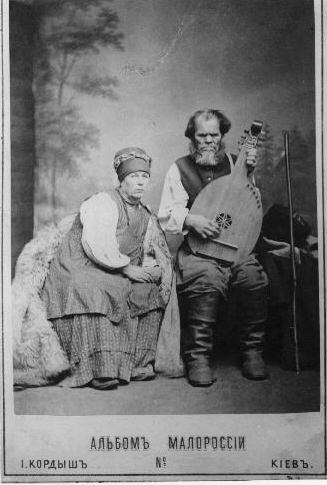 Veresai is probably the best known of the nineteenth century minstrels. He had exceptional musical ability and caught the attention of the painter Lev Zhemchuzhnikov who introduced him to scholars and other intellectuals. Veresai even traveled to St. Petersburg to perform before the tsar.